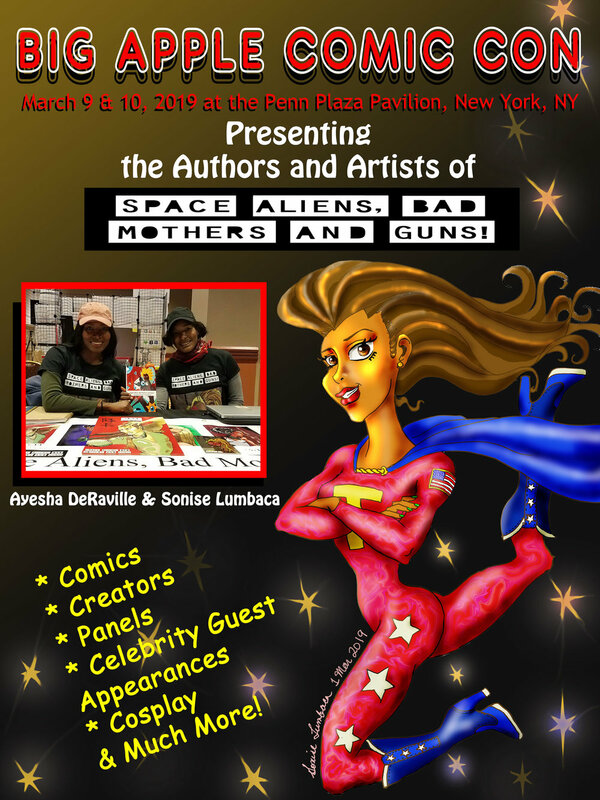 #SABMG - Welcome Space Aliens Bad Mothers and Guns! In addition to writing, Ayesha loves to travel internationally, paint with acrylic, listen to Death Metal (with hipster music being an occasional guilty pleasure) and watch documentaries and Metalocalypse! In addition to writing, Sonise loves to travel internationally, draw both free-hand and digitally and travel with her adorable, but insane black cat. The original O.G. Commander of the Enterprise, Star Trek’s William Shatner is slated to attend, as well as Luke Spiner of Star Trek: The Next Generation and Brent Colter of Luke Cage. VISIT https://www.bigapplecc.com/ for tickets and more information. SEE YOU THERE! We’re always looking for a few good contributors! If you have a short story that you would like for us to publish in our online magazine, are visiting an upcoming convention and want to let us know how much you enjoyed (or if you were disappointed), have us post an illustration that you’ve personally drawn or if you just would like to send us a comment to post DM us on Instagram @OfficialSABMG or @space_aliens_bad_mothers_guns. Our hearts are heavy with sadness hearing about the passing of Stan Lee. For some of us, it was almost as if we knew he would always be here with us. Each passing moment egged on our excitement of what would come next from him and his empire. Well, now the Universe has him and we hope he is there doing what he loves best. Stan Lee, the Man, will be missed, but he will live on in our hearts as we continue to dare to dream. Seeing any one of his characters, we hope, will almost be the same as seeing him. 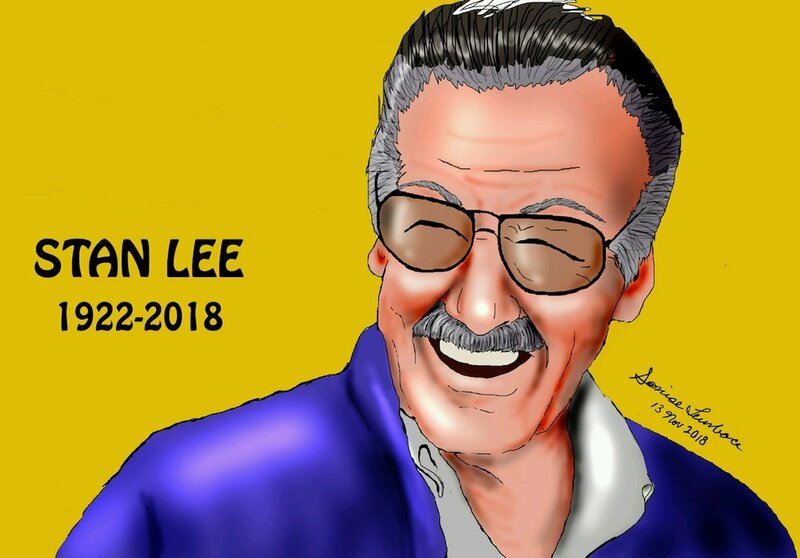 Each time we see Black Panther, Spider-Man, The Hulk, and Jean Grey or any superhero for that matter, we will be reminded of the great impact he had on all of us and the way he revolutionized the comic world. 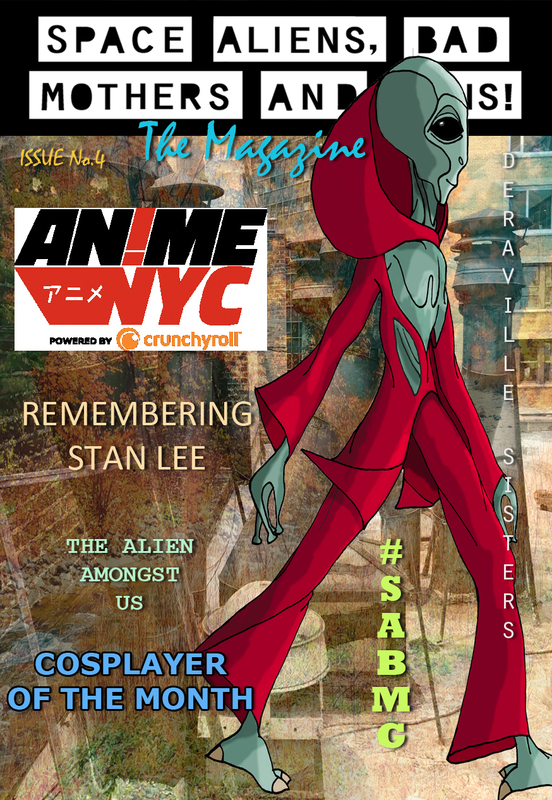 Check out the deets on this year’s New York Comic Con, Cosplayer of the Month, news about our SABMG book series and so much more. 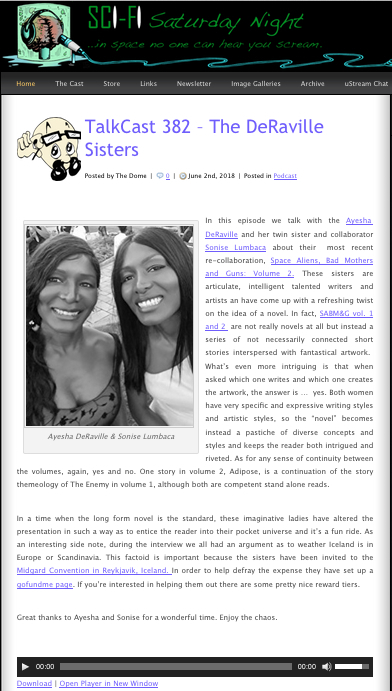 Issue #2 is out! click here! 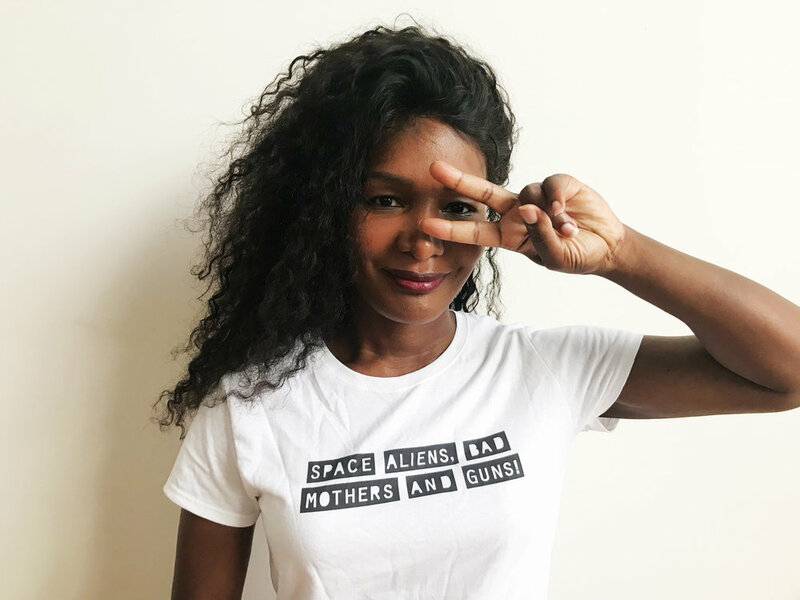 SPACE ALIENS, BAD MOTHERS AND GUNS! Volume 3 will be available on Amazon, September 1. Click here for more details! In this next volume "Adipose" returns continuing on with Celine and the Commander as they search for the path to the North. We also meet Frith, before she becomes "Frith" in the story "The Game!" Sonise has given us a nice dose of Fantasy, but she continues to point out those societal norms that we all are accustomed to, "rights and wrongs", with some twists and others with hilarity. We are excited to announce that Midgard 2018 has welcomed us to their event. It is Iceland's first all-inclusive convention! Some of you are also following us on our other social media platforms and are aware of our GoFundMe page. We greatly appreciate those of you that have supported us either with your donations, follows, likes and comments. There are a lot of emotions going through our minds as we prep our books and other materials for the approaching deadline. It's mind-blowing, exciting, and a little nerve-racking for us to imagine taking our books internationally. We will keep everyone updated as we move forward. Thank you all so much! 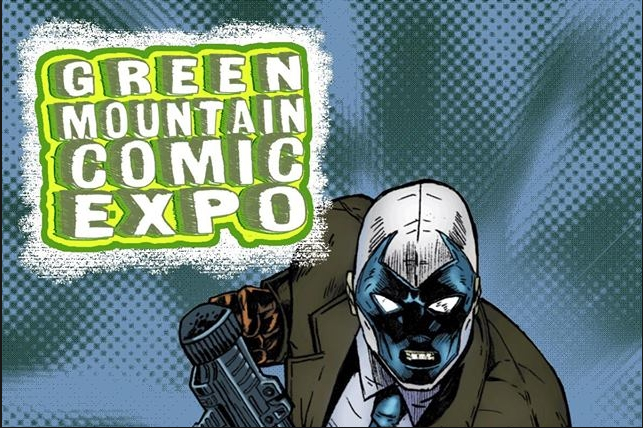 We are headed south to the Tidewater Comic-con in Virginia Beach, Virginia! If you have time, drop by and say hello! This will be our first time attending the Virginia Beach event being held from May 12th - 13th at the Virginia Beach Convention Center - 1000 19th Street, Virginia Beach, VA 23451. For information on the event please click the link below. For those of you looking for a more subtle design (though we prefer sporting Celine), our black T-shirts are in. Check out our Merch page and order yours today! SABMG! IS NOW ON YOUTUBE! 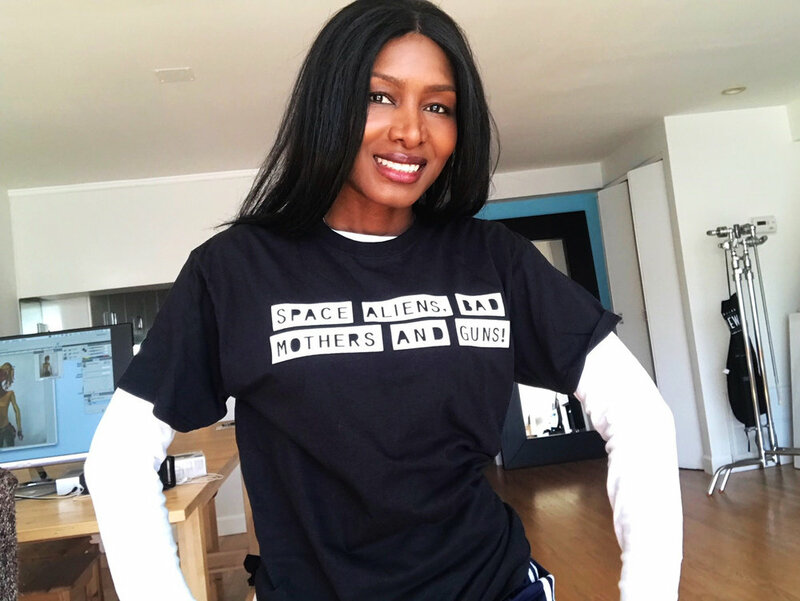 "Space Aliens, Bad Mothers and Guns!" 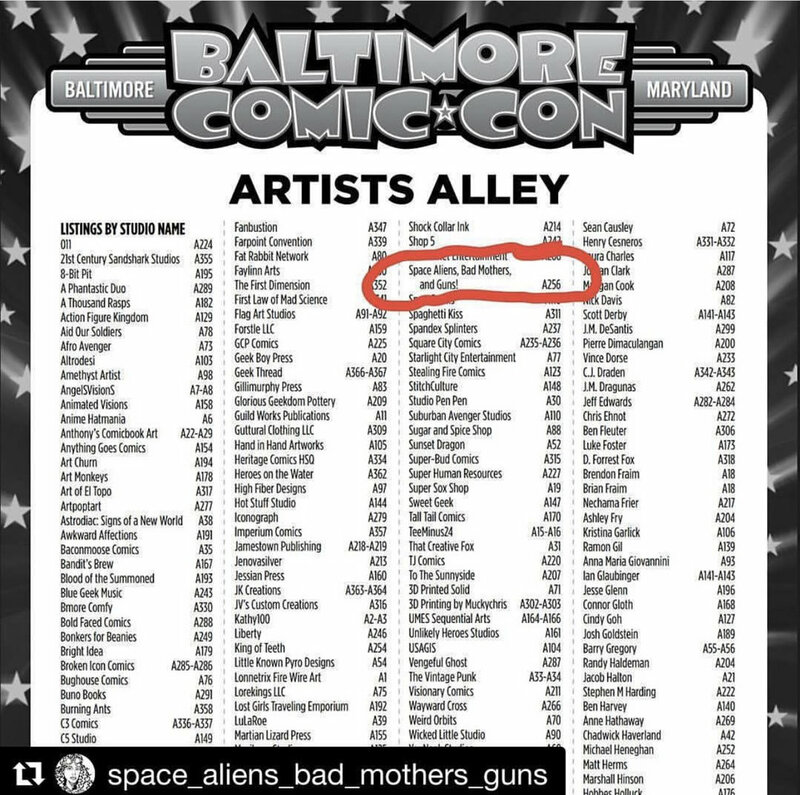 made it's debut at the 19th annual Baltimore Comic-Con! September 22-24!